The Women’s March on Chicago in 2017 was unforgettable, and the worldwide effort was epic. 250,000 women and allies showed up in Chicago to raise their voices for issues dear to them in supporting women’s and human rights. We celebrate that in 2018 as we continue to effect change together. 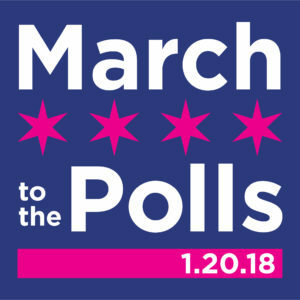 On Saturday, January 20th, Women’s March Chicago (WMC) will host “March to the Polls,” a rally and march where women and allies can come together in downtown Chicago to celebrate the spirit of the resistance efforts over the past year and unite to focus on the 2018 elections and beyond. The march will also serve as a kick-off for programming that empowers voters to support women’s rights and social justice. The location for the rally will be at Columbus and Congress in downtown Chicago. Please enter at Congress or Balbo. Families and Persons with Disabilities will again enter at Monroe and Columbus. Videos and Music will start at 9 a.m., Live Rally at 11a.m. and March expected to start off at 12:30 p.m.
Register individuals and groups with 10 or less here by hitting “REGISTER” to let us know you are coming! We will send you important updates via Eventbrite. Contributions are needed and can also be made here by clicking the “REGISTER” button as well! Women’s March Chicago is raising funds for porta-potties, fencing, staging, services and facilities for people with disabilities, audio and sound equipment, and other logistical necessities for our March on Chicago on Saturday, January 20, 2018. Register groups or organizations via the GROUP REGISTRATION FORM on our website. Additional information can be found in the flyer located here.